Most of the time, we are thinking of how we can make use of every corner of our home because we don’t want to waste space. 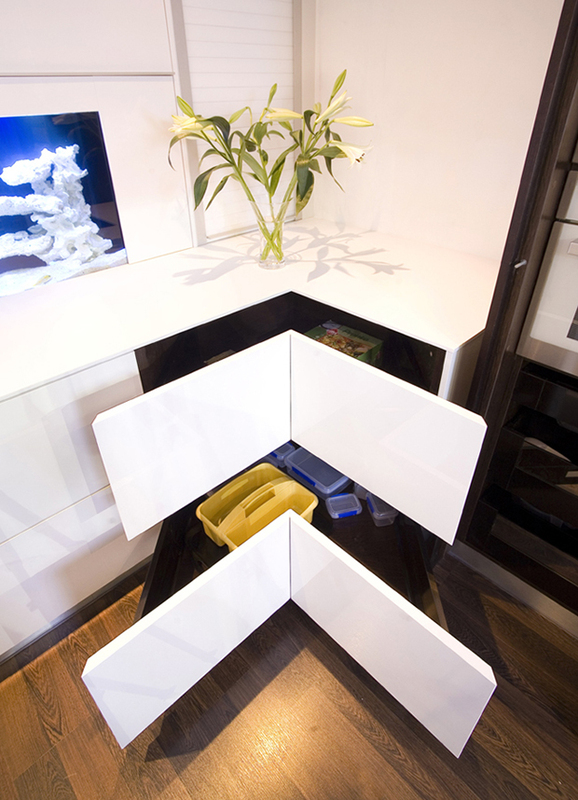 This would be used for storing some home items in order to be organized and avoid unnecessary clutter. 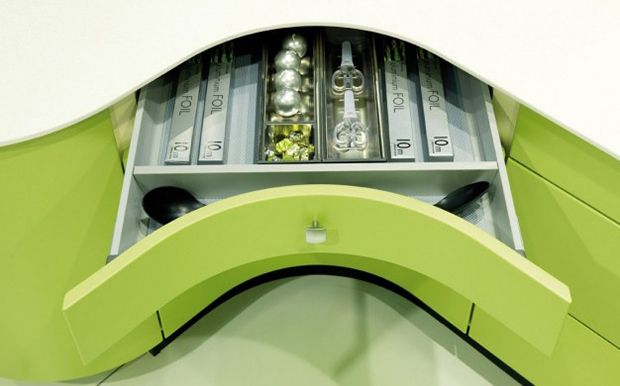 Luckily, some people have developed some interesting solutions to every storage and organization problem. And yes, it includes the cabinets we have in our homes. 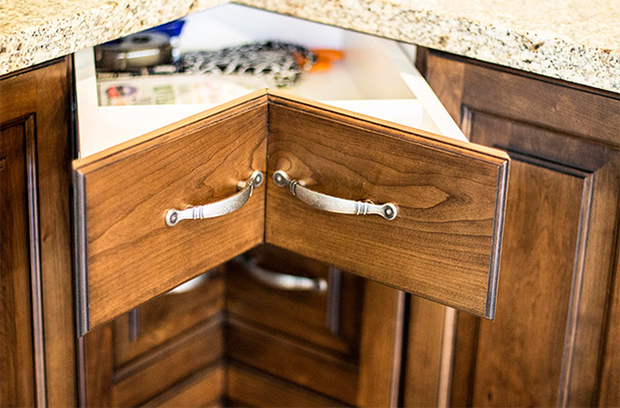 Speaking of cabinets, we have gathered some kitchen corner drawer designs that will help you access that corner in your kitchen. 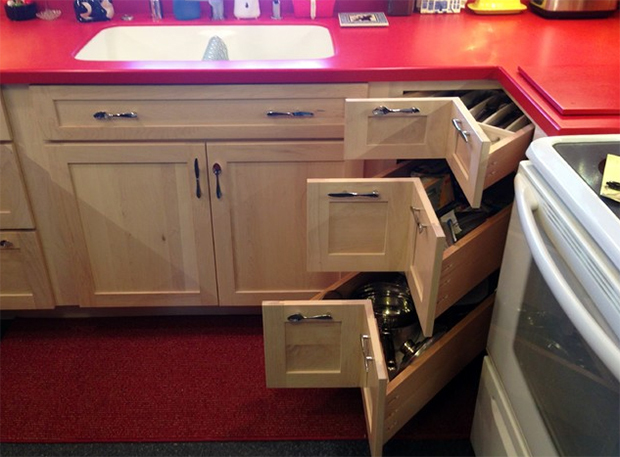 This will also give you more space to store pots and other kitchen items. Aside from that, it does look really cool and will add an interesting feature to your kitchen. Let us jump in and take a look. 1. 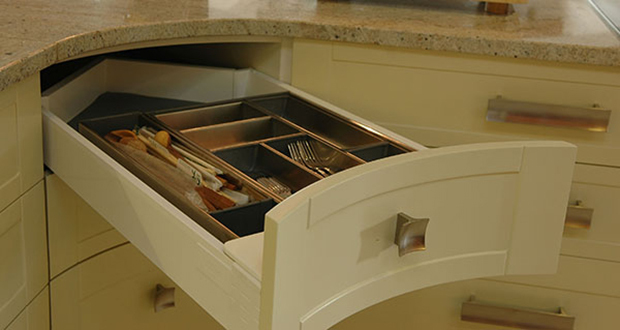 The Butterfly Corner Drawers is a nice way to store pans and pots and looks favorably fashionable too. 2. You can still make use of that corner space by using this idea. Brilliant Kitchen Corner Unit indeed! 3. Another way to add drawers to a corner is to have a straight side on the counter and then place some drawers under it like what we can see in this Bungalow Kitchen. 4. 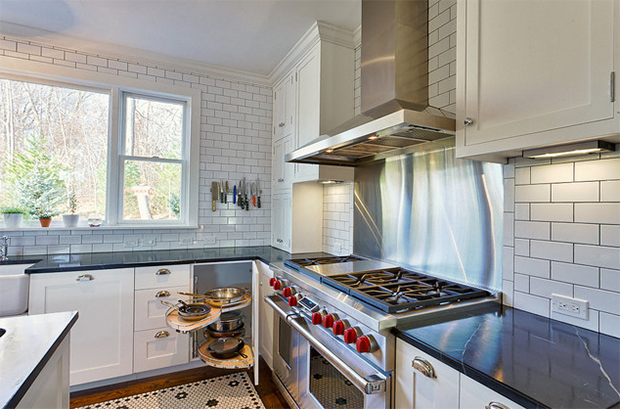 I so like how they did this one for a Modern Kitchen in San Francisco. 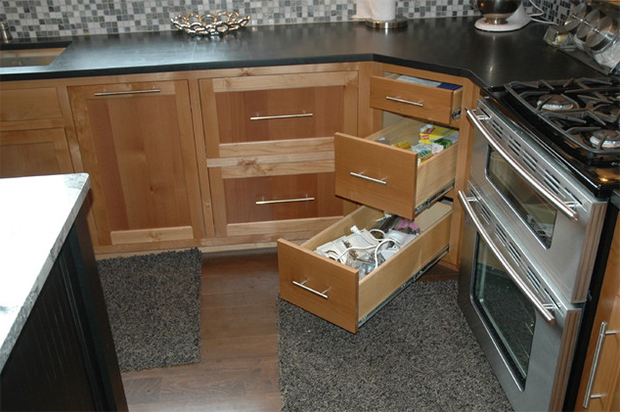 This drawer may be small but tall and could carry some kitchen items that you need for cooking. 5. Beautiful wooden cabinet for a kitchen corner in this Traditional Kitchen. Note the angle of the drawer’s faces. Interesting, right? 6. Who wouldn’t fall in love with this one? Instead of a edgy corner drawer, it has a curvy look! 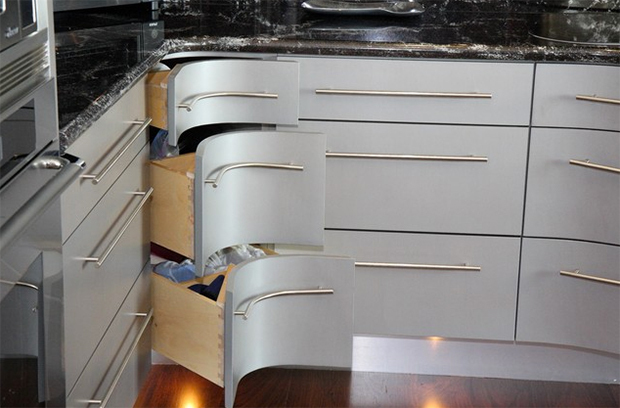 This is from a modern Newport Coast Kitchen that also had custom pulls to match the curvy shape of the drawers. Lovely! 7. One kitchen from the Triton Homes with white cabinets. And yes, it has a corner drawer too with half-moon pulls for some modern appeal. 8. 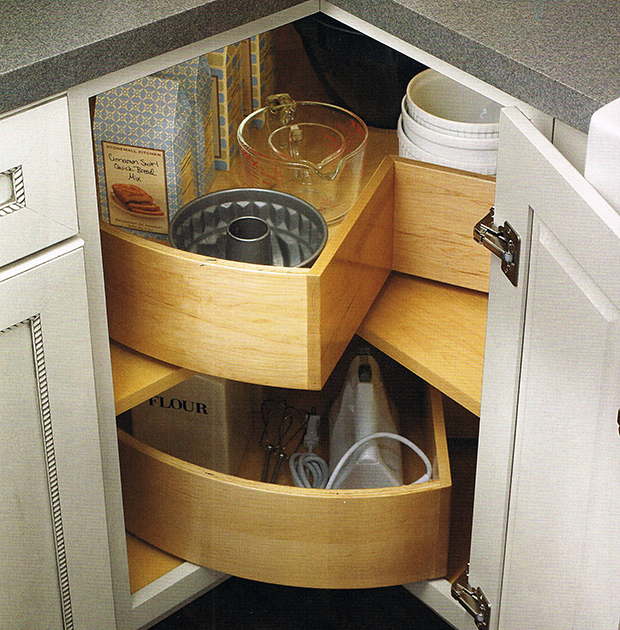 Lazy Susan is another good idea for corner shelving. This was has deep bins to make sure it won’t be hard to get the items. 9. This might be the same design that we saw on other drawers above but the molding and the pulls have sophisticated design for this Rustic Log Home. 10. 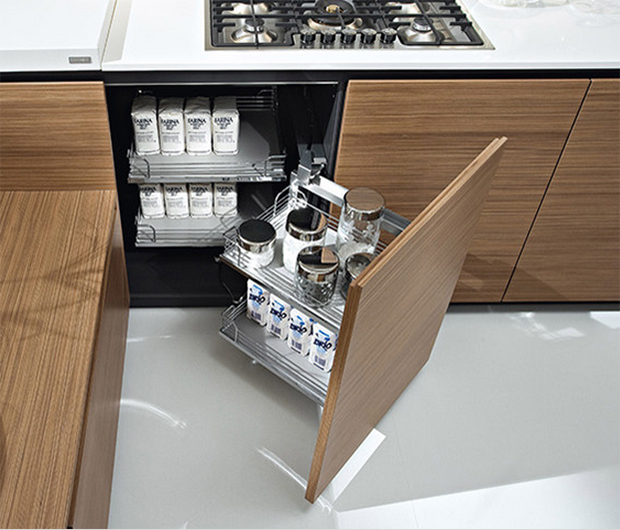 A LeMans unit that has oblong shaped shelves which operate independently. 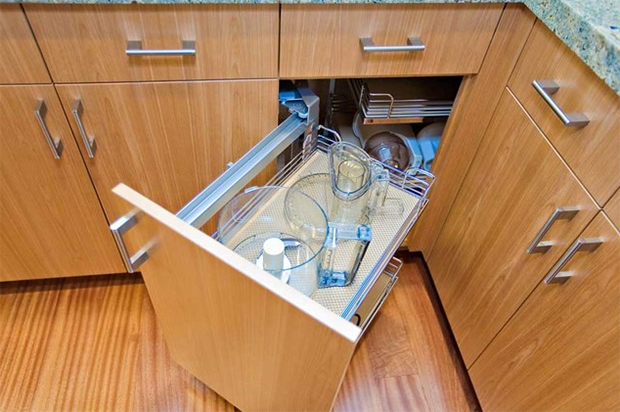 Worry not, you won’t find it hard to open this corner cabinet anymore. 11. 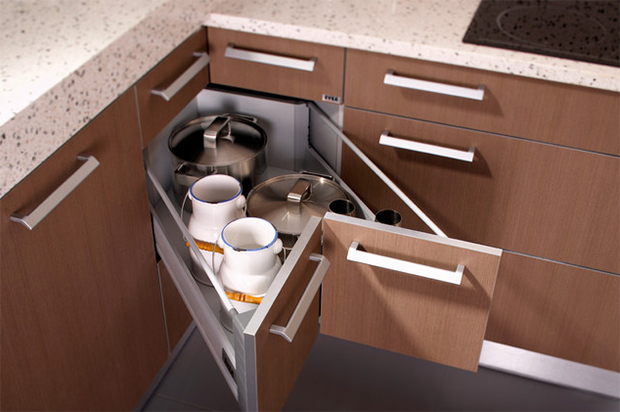 This capacious corner drawer unit brings in some sensuous contour and easy access to a kitchen corner. 12. 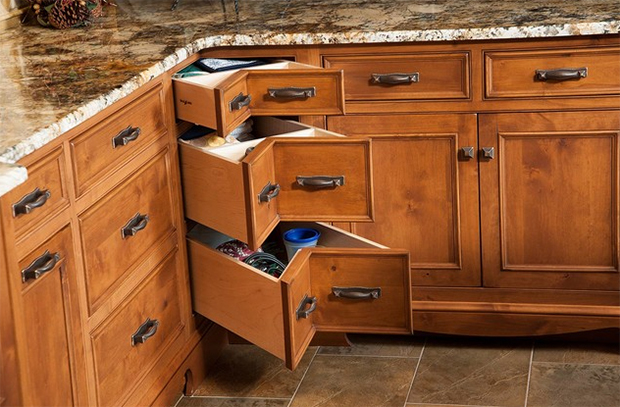 Pretty neat corner drawer-cabinets storage for a modern or contemporary kitchen. 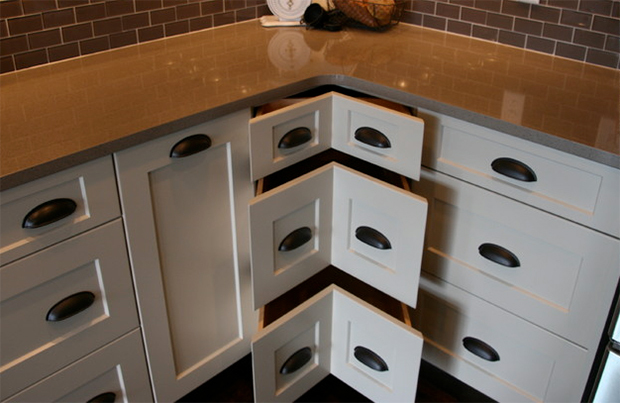 Note that even the drawers have divisions too for better organization. 13. For a modern minimalist kitchen, you can try having this white corner drawers that doesn’t have pulls. 14. 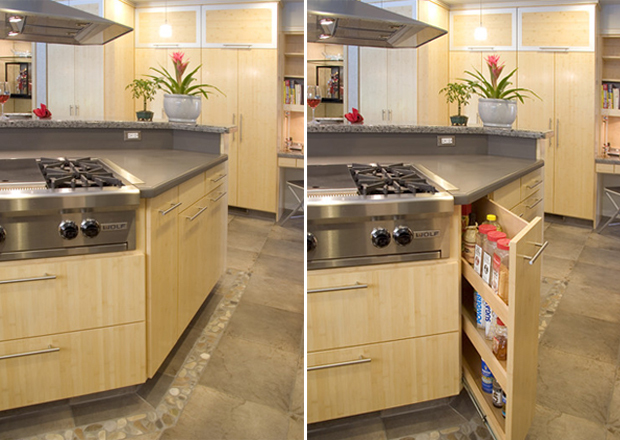 This San Diego Kitchen is blessed with an interesting storage area with a lovely face. 15. 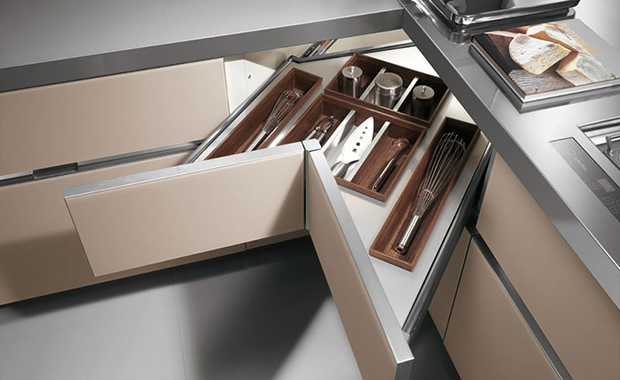 The Blum Corner Drawers will allow you to make good use of your corner while organizing cutlery on the topmost drawer. 16. This lovely corner cabinet for a traditional kitchen is from Schuler Cabinetry and is sold at Lowes. 17. You can also add some corner pull out shelves in your kitchen just like what you can see in this kitchen designed by PTACEK home. 18. 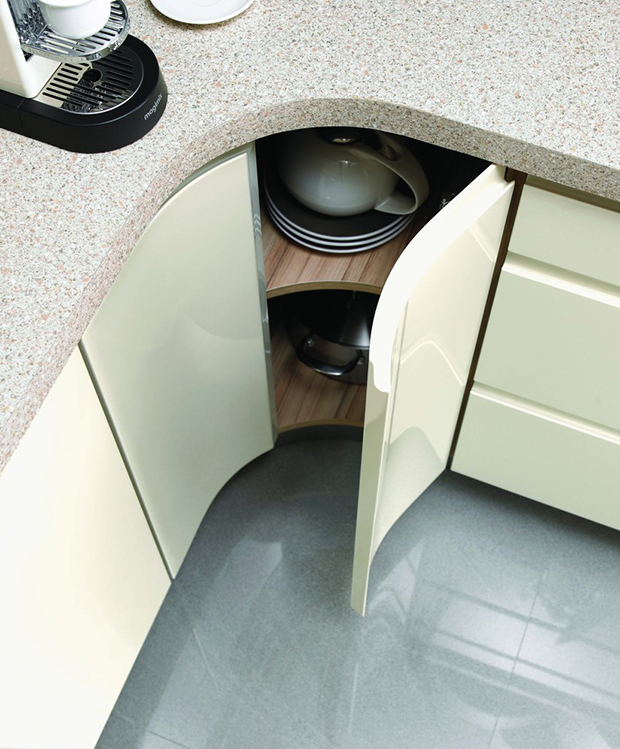 This Segrato Curved Split Door could be the perfect answer for a kitchen with a curvy corner! 19. 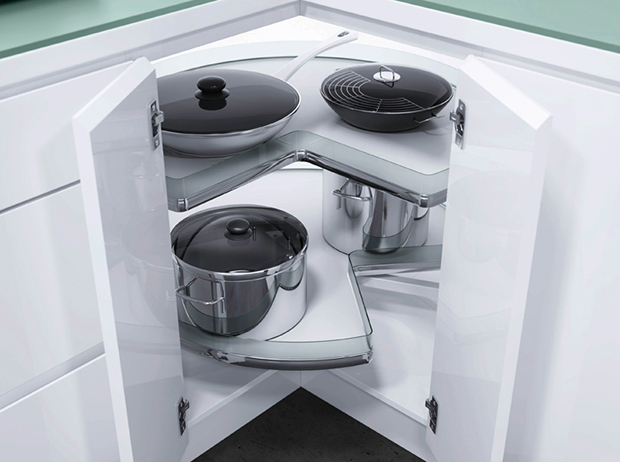 This beautiful Recorner maxx corner unit creates up to 20 % more storage space for the kitchen corner. 20. Another drawer with a curvy face. 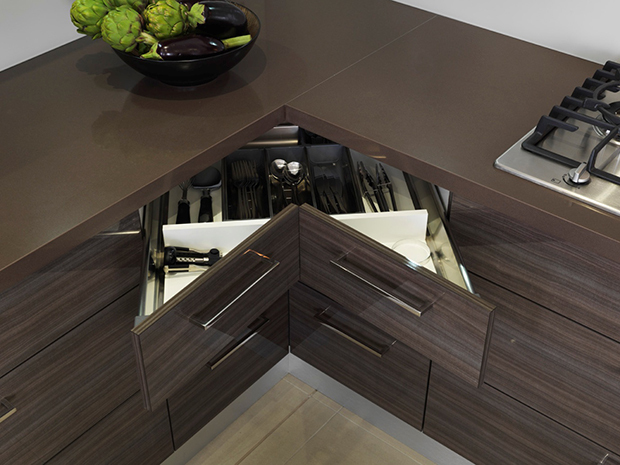 This drawer system isn’t just functional but is very gorgeous. I won’t wonder if you have saved some of the designs above or you have bookmarked this post because the kitchen cabinet drawers as well as some pullout shelves that we featured above are certainly useful! There is indeed a solution to every problem. And this is the answer to your dilemma of not being able to use that corner in your kitchen cabinet. It looks even fun and totally smart too. Know someone who is currently updating their kitchen cabinets? Share this post to them for some ideas!